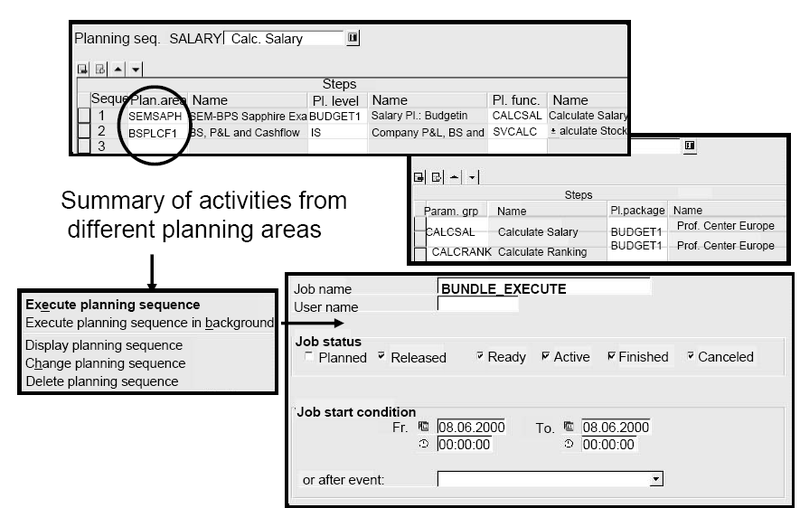 In large scale planning models, where many planning areas and levels are included, it is necessary to bundle not only those parameter sets of one planning level, but those across planning levels and areas of SAP BW.Especially if large portions or the whole planning process should be calculated, it is too expensive to carry out all the parameter sets manually.Therefore, the global planning sequence can be used to bundle and order parameter sets across planning levels and areas.If the processing of the global planning sequence takes too long, then it can be scheduled in a batch run. Background processing, on the other hand, begins straight away.It is possible to link global and local sequences together in one global sequence.In addition to this, you must also use a global sequence when your processing sequence covers more than one package. They can also be used for automatic planning functions. ABAP Editor is called either via transaction SE38 from the command line OR via Tools,ABAP Workbench,Development ,ABAP Editor. Jobs may be monitored via System,Services,Jobs,Job Overview. A “job log” may be called from here. 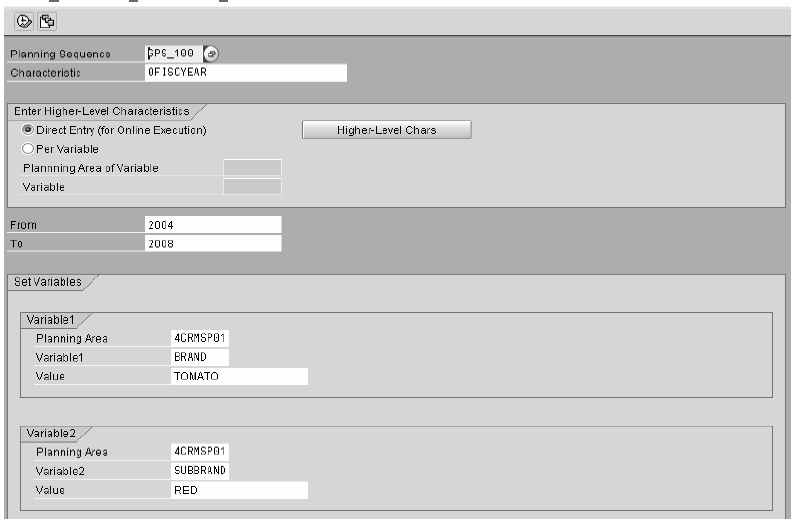 More detailed functions to control jobs are found via Tools,Computing Center Management System (CCMS) ,Jobs. The memory usage on the application server depends on several measures. For each user there’s an initial usage plus a variable memory usage which depends on the data volume that the user is processing. Increases during one planning session (new transaction and reference data is used/created). Data compression is used (by default) if buffered data is not currently processed. If a lot of the configuration is based on multi areas that contain many basic planning areas, then this can lead to high memory consumption.If possible functions and layouts should be based on the basic planning areas instead of the multi planning area. The reduction of the memory consumption can be estimated by viewing the structures of the planning areas in transaction SE11. 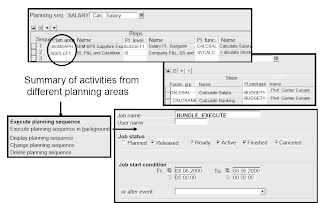 Multi areas should be only used for cases where data of several basic planning areas is required (for example, copy functions). This is especially true, if the data models of the basic areas within a multi area don’t align very well, which is the case when key figure based and account based data models are combined. Basically, the selection of a planning package is broken down into a set of more restricted packages (independent ad-hoc packages based on a partition characteristic), and those ad-hoc packages are executed independently. In other words: We convert one huge function into a set of smaller 'smaller' functions. This conversion is done during runtime and doesn't require the creation of additional packages as the selection of ad-hoc package is adjusted during the execution time. Setting up the planning packages in a partitioned way manually would be very cumbersome. Therefore, SAP provides program UPC_BUNDLE_EXECUTE_STEP that automatically partitions the packages of a global planning sequence using one characteristic. 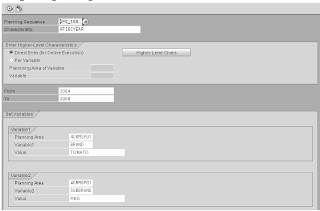 SAP Business warehouse Tools for Generic Data Extr..